The kangaroo family of marsupials -- animals with pouches for their babies -- have as many as 50 species, each with a different estimated life span. Some are rarely seen, so it's difficult to know how long they live. Red, Eastern gray and Western gray kangaroos are more common and have better known life spans. At up to 7 feet tall, red kangaroos are the largest marsupials in the world, and generally live longer than other kangaroos -- up to 22 years in the wild and 16 in captivity. Red kangaroos are found mostly in the central plains of Australia. At 5 or 6 feet tall, Eastern gray kangaroos are slightly shorter and heavier than red kangaroos. Eastern kangaroos live along the east coast of Australia, and can live 8 to 12 years in the wild and up to 20 years in captivity. Western gray kangaroos live to be between 9 and 13 years old. They inhabit the western and southern areas of Australia. They're smaller, thinner and lighter weight than the Eastern gray kangaroos. Kangaroos are known for their hopping, jumping and leaping -- and for good reason. They can leap a distance of 25 to 30 feet in one hop, or jump up to 10 feet high. They typically travel at a speed of about 12 mph, but in short spurts their speed can increase to 35 mph. 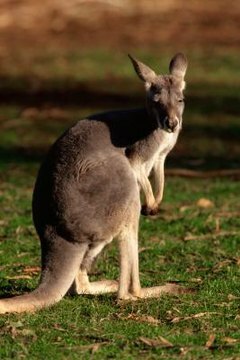 What Is the Habitat of an Australian Kangaroo? What Kinds of Colors Can Kangaroos Be?